German Ambassador Martin Kobler has said that he is deeply impressed with and is in love with Pakistan due to the warm hospi­tality he always received from the Pakistani people and the heritage-rich beautiful land­scape of the country. He made these remarks during his visit to Air University, Islamabad. On the occasion, the German envoy was warmly welcomed by the Vice Chancellor, Deans, Directors, HoDs, faculty members and a large number of students. The ambassador, during his visit, admired the state-of-the-art building and an overall aura of modernity by labeling it as a “mod­ern”, “friendly” and “green” University which is right way headed into the future. 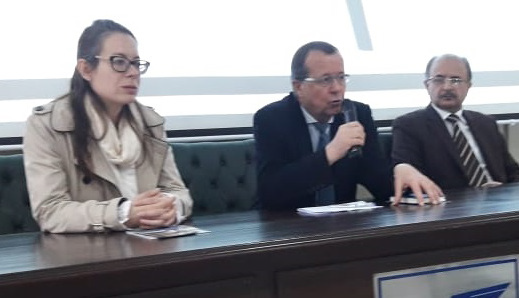 Advising the students intending to apply for Masters and PhD admissions in German Universities and subsequently for a German visa, he said that they should apply for admissions and then for visa as early as possible. He also ad­vised that after booking a visa appointment students must show up for visa interview and make sure that they brought with them all required documents. Otherwise, a new visa appointment may take as long as six weeks, Kobler said. While answering a question, the ambassa­dor regretted that Pakistan’s present input to research and education was not adequate enough which was evident from the fact that a nation armed with nuclear weapons was surprisingly not even able to produce ex­port quality bicycles and relied heavily on imports from other countries for even such minor commodities. The reason for such de­ficiency, according to him, was definitely not a lack of potential, but a lack of serious and focused approach. He assured that Germany was ready to support and cooperate in vari­ous areas of development in order to empower Pakistani youth and make Pakistan leap forward in the 21st century. The German ambassador, during a lively question and an­swer session, showed a strong desire to further strengthen bi­lateral relations by enhancing cooperation especially in the areas of youth development & education, climate change & energy, and modern economy. On the occasion, Ms. Inge Iqbal, Director German Academic Exchange (DAAD) in Pakistan also explained different oppor­tunities available for academic and research collaboration be­tween Pakistan and German universities.